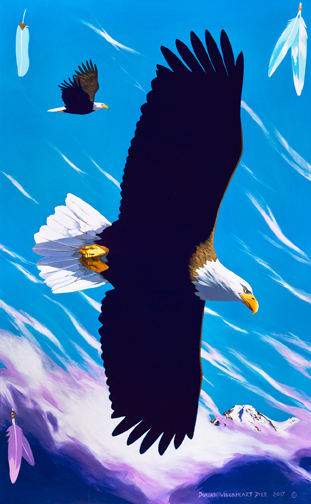 Image Size: 23" x 36"
This was the first in the great Eagle series paintings, It began as a single large eagle in a clear blue sky, and so it remained for 6 years as I thought it was done. Then one day I realized it wanted to become more, so I added the second eagle as its mate, and the Storm clouds and mountain. Two years later I added the feathers in the corners. This painting embodies the strength we all carry to master the adversities of life, and to grow, heal and gain compassion, wisdom and understanding. The mountain represents the spiritual heights attained through this process of life's alchemy. Original painting is 42" × 68"